Tomorrow I will be presenting a webinar for the Wisconsin State Genealogical Society on finding religious records in the Great Lakes region of the United States. You can find more information about the webinar here: https://wsgs.org. In January I had the pleasure of coordinating a course at the Salt Lake Institute of Genealogy (SLIG) with my colleague Kathryn Lake Hogan, PLCGS who specializes in Canadian research. This webinar is a sprout from that course and I am excited to share some history, tips, and strategies for finding the religious records of Great Lakes Ancestors with a new audience. Learn to use Google’s MyMaps with Me at SLIG’s First Tech Day! 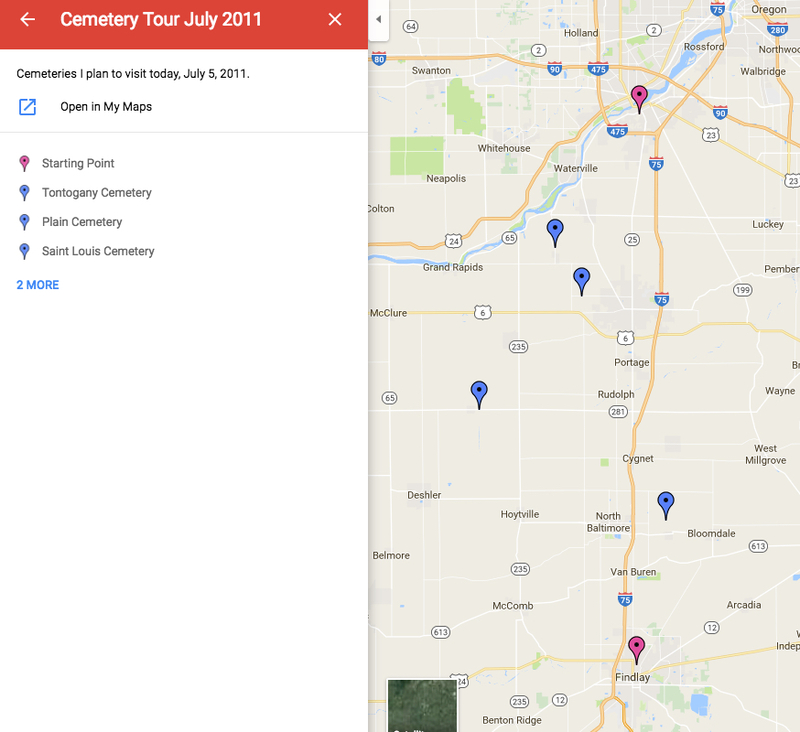 Using Google’s My Maps, I was able to plan out a day-long cemetery trip in Wood County, Ohio. 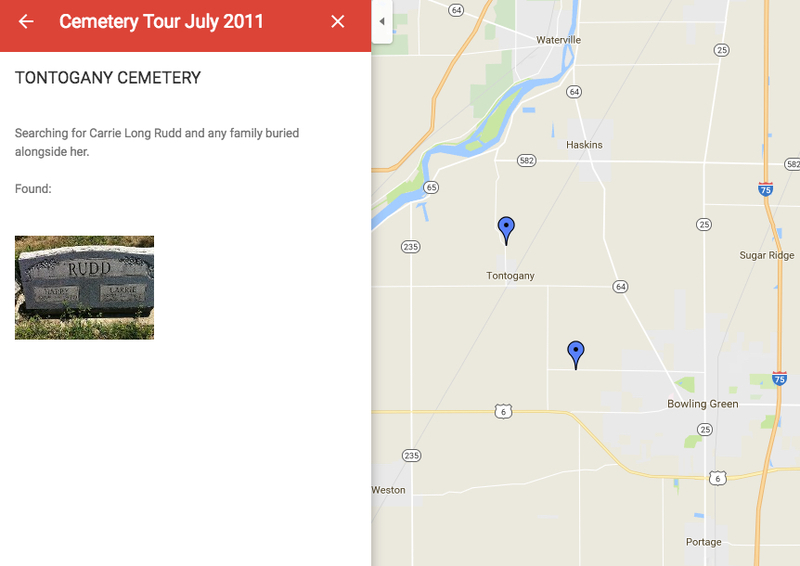 I wanted to visit four different cemeteries between my grandma’s house in Perrysburg and ending at my dad’s house in Findlay (Hancock County, just south of Wood). Before the trip, I took some time to plot out those four cemeteries on My Maps so I could better plan the driving route, where we’d need to stop for lunch and bathrooms, while also being efficient with our mileage and time. By plotting them on the map, and then zooming in, I was able to plan an efficient driving route. Also, I used this interface to create a research plan. Within each pin, you can create labels and store information. In this case, I recorded whose burials I was hoping to locate within each cemetery. But it also acts like a research log in that while I was in the cemetery, I was able to access My Maps using my smart phone, and added the tombstone photos directly into my map. I did this for each of the four cemeteries. You may notice that this trip was completed in 2011. Google stores your maps in your Google Drive indefinitely. You can also share your maps (either privately or publicly) so that if you are coordinating a trip with a friend or relative, you can both access and work on the maps. There are a number of publicly available maps created by other users that you might find interesting. This one on the Civil War (not created by me) demonstrates some of the features such as creating shapes and using color. Whenever I create a new lecture, I invariably learn new resources that I can add to the information I already planned on sharing or am reminded of things I’ve forgotten or don’t utilize as much in my own research. This course’s prep is no different. I have gathered a lot of information and resources that I plan on sharing with the students in the class. I thought I’d share two of those bits of information. While looking at WorldCat for a copy of Lloyd Bockstruck’s book Revolutionary War Bounty Land Grants Awarded by State Governments published in 1996, at a library near me, I discovered that it is available as an e-book through Ancestry(subscription required). 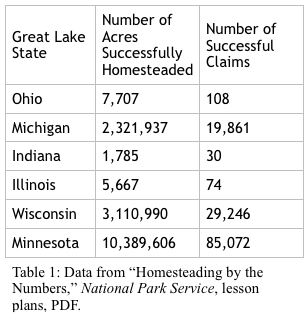 I’m having a fun time putting this information together to highlight the Great Lakes region and I do hope you will consider joining us in January! To register, visit the SLIG website. I have been attending SLIG (and other institutes) for many years. If you are looking for a more in-depth education on a particular topic or area, you should be looking at institutes to supplement your genealogical education. While national conferences allow you to get a “taste” of many different topics, smorgasbord-style, institutes allow you to focus on one topic for the entire week. SLIG has the added advantage of being near the Family History Library where research can be conducted after class (or if you come a little early or stay after the institute). I hope you will consider signing up for one of these classes! Seminar in Shreveport was a Success! 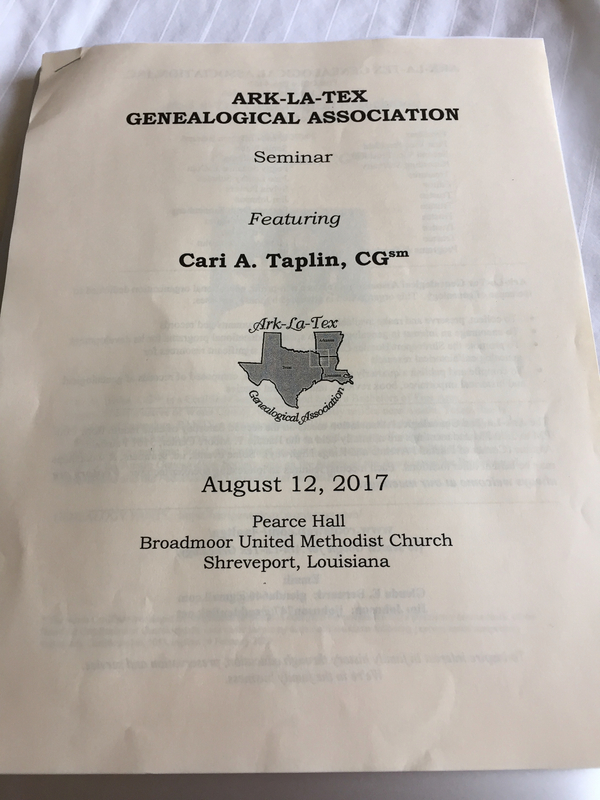 I just returned from a wonderful time speaking at the Ark-La-Tex Genealogical Association‘s annual seminar. What a fantastic and friendly group of folks to work with! 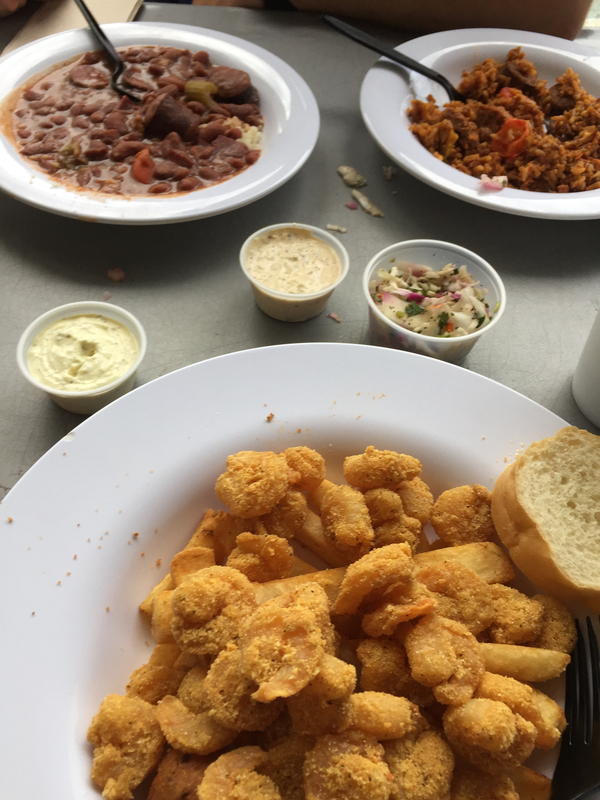 Since Shreveport isn’t that far away, my husband and I drove, seeing some of eastern Texas that we haven’t had a chance to explore yet. Of course, our drive there, on Friday, was met with all kinds of road construction, which made me a little anxious. I don’t mind delays AFTER an event, but before, it makes me nervous. But, we made it! A few of the society members took us out to a nice Chinese restaurant where we had great food, fun conversation, and waited out a thunderstorm that gave the electricity a few flickers. As luck would have it, when we were finished eating, the storm was over. Our host, Jim, took us on a little drive around the city showing off a few of the local spots such as the Riverboat Casinos, old downtown courthouse area, the Music Auditorium, and other attractions. It was a fun evening. Also in attendance was a man who writes a blog called Prune Picker; his post reviewing the seminar, with some fun photos can be read here. I had a lovely experience with this group and hope I will cross paths with them again someday. After the seminar, and after a brief rest, my husband and I found some delicious “Louisiana food” for dinner, followed by some ice cream. And then I slept very well Saturday night! On our drive home, we took a different route and enjoyed driving through three different National Forests along the way. If your society is looking for a seminar speaker, I’d love to hear from you. I’m booking the 2018 and 2019 season now. 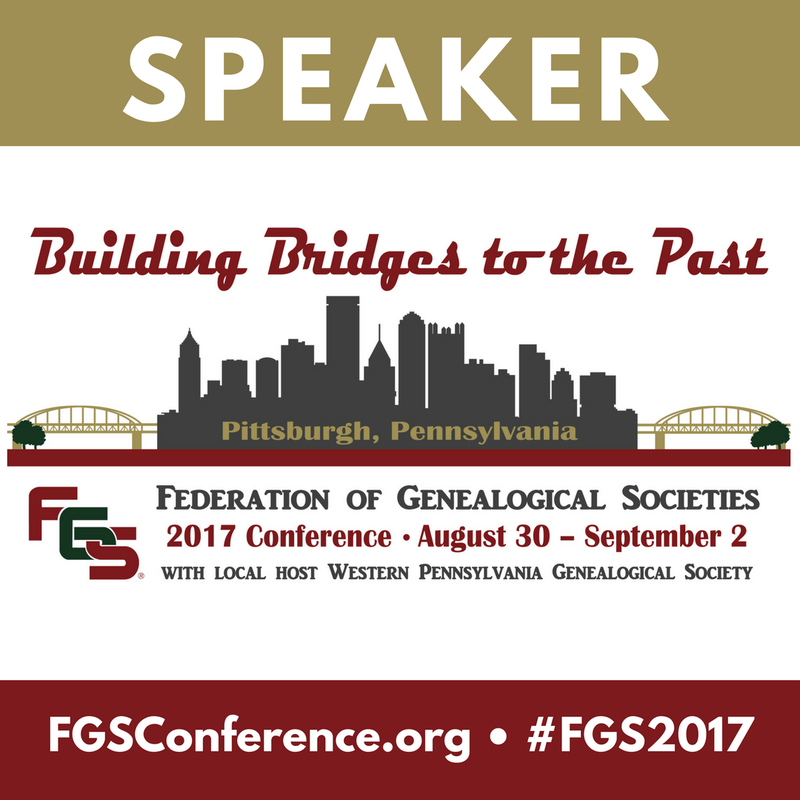 At the end of the summer, I will have the pleasure of being a speaker at the Federation of Genealogical Societies’ Conference “Building Bridges to the Past” being held in one of my favorite cities: Pittsburgh, Pennsylvania! The conference will take place at the David L. Lawrence Convention Center August 30 through September 2, 2017. If you have never been to a genealogical conference, it can be an excellent way to get a taste of a lot of topics at one venue. Each day there are approximately seven different lectures to choose from at any given hour, sometimes making it difficult to decide! I use these opportunities to attend lectures that match where I either 1) know very little or 2) address a current research project or problem. I hope to see you in Pittsburgh! 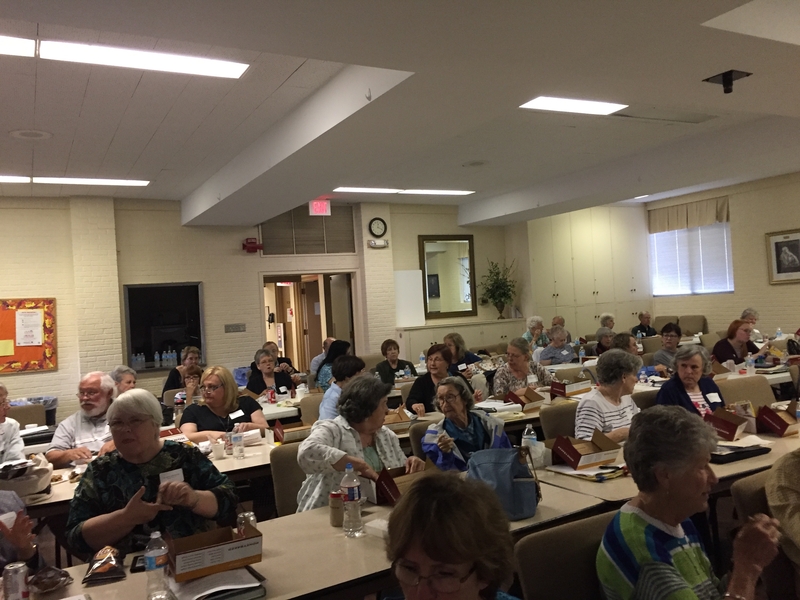 In Austin, TX, May 22-25, 2017, I will be part of the faculty presenting the first annual Texas Institute of Genealogical Research (TIGR). The institute will be a week long, with focus solely on Texas. I am excited to be presenting “Shining Stars and Hidden Gems: Research Repositories of Texas.” Since moving to Texas two and a half years ago, I have made quite an effort to visit some of the wonderful research repositories in this BIG state. I have had some fantastic experiences and have gotten to hold in my hands some of the most precious and descriptive letters from the time of the Texas Revolution. One project I have been involved with has been examining the personal writings from men who served in the Georgia Battalion. On a research visit to the Dolph Briscoe Center for American History, located on the University of Texas campus, I had the privilege to read some very interesting and heartbreaking letters describing the times and conditions of the soldiers. Letters written by John Sowers Brooks, available for viewing at the Briscoe Center, describe the terrible conditions the soldiers had to endure and are saturated with the loneliness these men must have felt. Letter from John Sowers Brooks, to his father, dated 25 February 1836, from Fort Defiance, Goliad, Texas; Briscoe Center for American History, box 3H90, Folder “Brooks (John Sowers) Papers [no folder numbers]. Unfortunately, John Sowers Brooks was injured in battle, having received a bullet to his thigh which shattered the bone. He died during the massacre of Fannin’s Men at Goliad on 27 March 1836. There are more letters to tell this tale. And hundreds of other tales of the Texas Revolution as well. The letters and stories are hidden in archives and manuscript collections across the state. My lecture at TIGR will share some of the repositories you can visit to find them. I hope to see you there!